If you love nuts, and you love chocolate, this 1 lb., 15 oz tin gives you the best of both worlds. 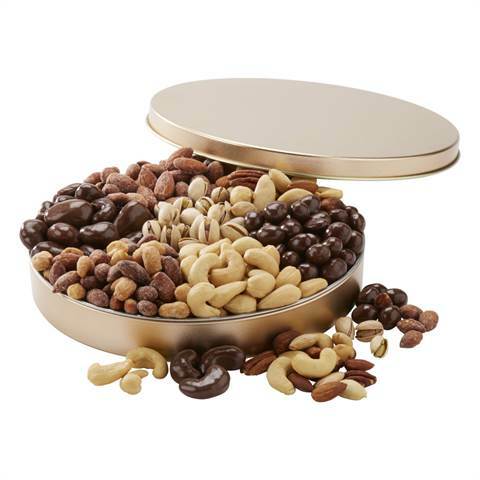 There's seven varieties of premium favorites in one tin including Chocolate Covered Peanuts, Super Giant Cashews, Chocolate Covered Almonds, Pistachios, Holiday Confetti Mix, Chocolate Covered Raisins and Giant Mix. Ingred: milk chocolate (sugar, cocoa butter, chocolate liquor, milk, soy lecithin (emulsifier), artificial flavor (vanillin), peanuts, partially hydrogenated palm kernel oil, cocoa (may be processed with alkali), whey powder, gum arabic, corn syrup, certified confectioners glaze. Ingred: peanuts, raisins, coconut, cocoa gems (confectionery coating (sugar, vegetable oil (fractionated palm kernel), cocoa (processed with alkali), non fat milk, whey, soy lecithin (emulsifier), vanillin (artificial flavor) coloring (includes yellow 5 lake, yellow 5, blue 1 lake, red 40 lake), gum arabic, corn syrup, confectioners glaze (carnauba was, beeswax, shellac), sea salt. Ingred: milk chocolate (sugar, cocoa butter, chocolate liquor, milk, soy lecithin (emulsifier), artificial flavor (vanillin), raisins, partially hydrogenated palm kernel oil, cocoa (may be processed with alkali), whey powder, gum arabic, corn syrup, certified confectioners glaze. Allergen Statement: Contains milk, soy. Ingred: giant almonds, cashews, brazils, pecans, filberts, sea salt, peanut oil. Ingred: milk chocolate (sugar, cocoa butter, milk, chocolate liquor, soy lecithin (emulsifier), artificial flabor (vanillin), almonds, gum arabic, corn syrup, sugar, certified confectioners glaze. 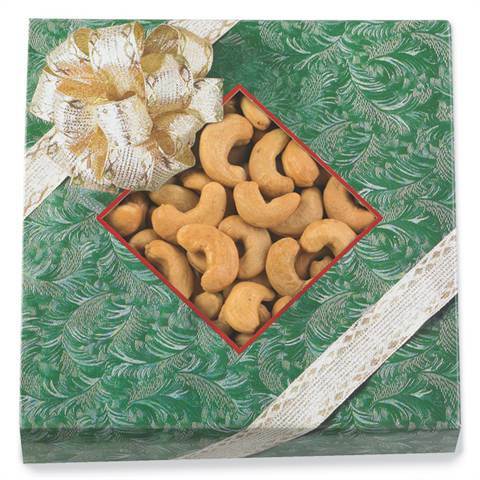 MANUFACTURED ON EQUIPMENT THAT PROCESSES OR PACKAGES PEANUTS AND OTHER TREE NUTS. MAY CONTAIN TRACE AMOUNTS OF OTHER NUTS.